As nonprofits and other organizations try to transport food and other supplies to the Philippines amid theTyphoon Haiyen​ devastation, many groups are struggling with distributing aid within the damaged archipelago's infrastructure. The relationship between logistics and natural disasters is often complicated if infrastructure such as roads and airports are destroyed during severe weather events. This could slow down distribution of vital disaster relief, especially considering the damage and death Typhoon Haiyen has left in its wake. The nation's government estimated there have been 2,300 deaths, with tolls expected to rise in areas such as Tacloban, according to Business Insider. The UN said up to 11 million people have been affected by the typhoon and approximately 600,000 have been displaced in the aftermath. The economic losses stemming from the disaster are approximately $15 billion, which is considered low because some of the poorest parts of the country were the worst hit. Much of the infrastructure of these regions, which were already remote to begin with, was demolished. 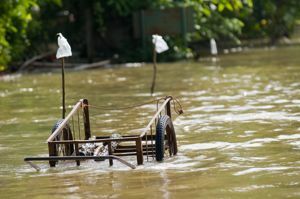 The problems nonprofits face with disaster logistics are much different than typical business logistics, according to Ann Campbell, a professor of management sciences at the University of Iowa's Tippie College of Business. Campbell's research focuses on increasing efficiency for transporting supplies to disaster areas. Organizations need to take into account what resources or infrastructure might fail in the event of a disaster. Since road infrastructure might be damaged or destroyed after a disaster, organizations should try to communicate this information to supply vehicles. "In a disaster, it is important to recognize that information on road conditions is slow to come in," Campbell said on the University of Iowa's site. "Also, cell phones usually don't work so it is important to give drivers as much information as possible before they leave the depot with supplies." Procurement strategies for emergency preparedness are important in determining distribution of disaster relief supplies. As part of her research on disaster logistics, Campbell is studying where supply depots should be positioned before a storm hits. "If you put them too close to the coast, for instance, they might be destroyed by the storm, so you have to put them someplace that's far enough away to be safe but no so far that it takes too long to get the supplies to the people who need them," she said.